Bring 2 quarts of water with 2 tsp. of salt to a boil. Boil macaroni until al dente, approximately five minutes. Strain and rinse with cold water to stop the cooking. Drain pasta and place in a bowl large enough for the final dish. Mix half of the sharp cheddar and 1/2 cup of milk with the cooked macaroni. Mix the grated parmesan, dry bread crumbs, and paprika in a separate bowl and set aside. Melt the butter in a small sauce pan over medium heat. Add the flour, stirring until the roux cooks to a light, golden brown. Remove from heat and set aside. Heat the remaining milk in a double-boiler with the Worcestershire sauce and 1/2 tsp. of salt. Add the grated cheeses and allow to melt. Once the cheese has all melted, add the roux and whisk until the sauce is smooth and creamy. Mix sauce into bowl of cooked macaroni. 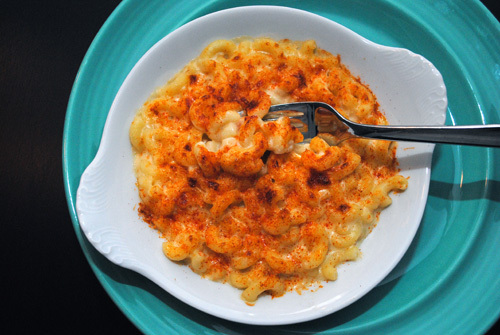 Spoon the macaroni and cheese mixture into portion sized, oven-safe dishes. Sprinkle each portion with approximately 2 Tbsp. of the topping mixture. Broil in the oven until the topping melts and slightly browns, approximately 2 minutes, then serve immediately.